Tennessee Republicans, from the party that boasts it is for lower taxes, just raised taxes in the Volunteer state as they wound down this year’s legislative session. The party which enjoys a dominant super majority, controlling the House, Senate and Governorship, raised the Gas Tax on every Tennessean. Note that even if you don’t drive, the gas tax will apply to you since prices on anything delivered by trucks will most definitely increase. And those increased transportation costs will be passed on to you, the consumer. 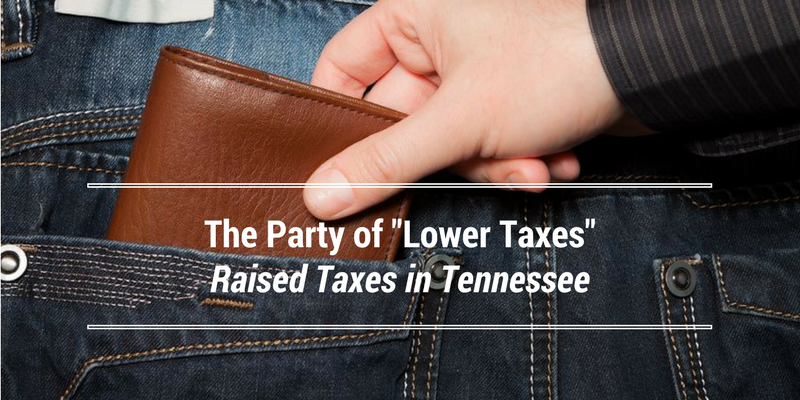 It’s as if legislators just pick-pocketed Tennessee taxpayers. But here’s what’s even more astonishing about the haste by legislators to raise the gas tax. Tennessee enjoyed a $2 Billion surplus this last budget year. And this coming year, the state of Tennessee projects another $1 billion surplus, as well as in subsequent years. Because a government’s primary source of receipts is through taxes and fees, a surplus suggests that citizens are being overtaxed. But rather than reduce the state’s tax rate, Governor Haslam and dozens of other Republicans chose to keep taxes at their current levels, thus continuing the state’s surplus. So not only were Republicans content with overtaxing Tennesseans, but they compounded the matter by increasing the Gas Tax as well. I have held cordial and pleasant relationships with most of my local area Republican representatives. But being friends on a political or even social level, does not mean that one should turn a blind eye, or censor one’s comments. The fact is that when those professing to be fiscal conservatives while campaigning, violate fiscal conservatism when elected, it’s incumbent in our form of government to call these individuals to account. The full list of legislators who voted for and against the Gas Tax is here. I acknowledge that many of Tennessee’s roads and bridges are in need of repair. And to be clear, those of us who opposed the gas tax are NOT against increasing the amount that our state allocates towards our road budget. Rather, our opposition has always been that the default answer by most Republicans was to raise taxes when there are multi-billion dollar surpluses that are available to fund every penny of the Governor’s proposed road budget increase. What is inexplicable about the whole gas tax matter though, is that every initiative that was proposed that sought to avoid tax increases in favor of using surpluses to fund road repairs was met with intense opposition by the governor and Republican legislators. It was clear they would not take NO for an answer to their gas tax increase. And why they were stuck on a gas tax increase is something we may never know. But here’s the problem with “tax & spend” legislators using this quote. In every relationship there are negotiables and non-negotiables. Consider the most fundamental relationship: marriage. But if that same husband is faithful to his wife 80% of the time and carouses around “just” 20% of the time, he is a 100% traitor to his wife and vows, and he shouldn’t be surprised when an attorney delivers the divorce papers. Obviously, all matters are not equal. So when a Republican legislator professes that he/she is a fiscal conservative, then a non-negotiable should be the matter of raising taxes when there are better alternatives. Utilizing a multi-billion dollar surplus would seem to be a better alternative than raising taxes. So don’t buy this distortion of Reagan’s quote. The very legislators who rush to Reagan for cover are the same ones who are unfaithful to the values that Reagan espoused and lived, at least in the area of raising taxes in 2017 in Tennessee. So I wonder what’s next from these legislators? Your guess is as good as mine, but betting on the fact that they’ll stand firm against tax increases is no longer a given. Party, Principle or Pragmatism? What Drives the Tea Party? With the inauguration of our new President just hours away, our nation is approaching new, unchartered water. Of course, the same could be said of the era we were entering eight years ago. But just as there were troubling reasons why Obama was elected then, so there are gnawing explanations as to why Trump was elected in November. As George W. Bush was quick to sacrifice many of the values that historically characterized conservative orthodoxy, his popularity plummeted and contributed to the election of the most “progressive” President to ever lead our nation. And with the election of Barack Obama, the political polarization that gained steam during the Bush years skyrocketed under Obama. But as Republicans over the last eight years continued to say one thing and do another, particularly when they controlled both houses of Congress, voters grew more and more frustrated with the Party of Lincoln. Consider that while there were 17 Republican candidates for President, ultimately the 16 “Party-faithful” candidates were rejected in favor of Trump, someone whose political credentials were questioned by many. One could ask then whether the victory in November was that of a Party or a personality? And will the coming Trump era see Party, Principle or Pragmatism prevail? As someone who has consistently voted for Republican candidates, I have always favored principle over party. So in 2009, as the tea party movement was launched, I took an active role, with millions of other Americans, in expressing my grievances with both parties. Since then, while certainly much of our movement’s protests were focused on Obama’s policies, a considerable amount of our ire was directed towards Republicans as well. The party of conservatism had, for the most part, lost its compass. The truth is there is little evidence that Trump is a conservative Republican, in the purest definition. Not only does his multi-decade track record affirm this reality, but many of the policies he campaigned on are at odds with long-standing Republican positions and orthodoxy. I won’t take the time to recite the myriad of examples but these articles here and here reference several of his most glaring departures. 2) Democrats tired of the failed policies of the Democratic Party, for which they had voted for in prior elections. So with Trump’s rise to the Presidency we witnessed a powerful new constituency, the Pragmatic voter. No longer was Party the driving factor for many. Nor was Principle the overriding variable for others. Rather, Pragmatism ruled the day. But with the election now over, and Trump stepping forward to lead, versus merely tweet, his words will soon morph into policies, laws and regulations. As this occurs, it will be telling to see if the millions of voters who supported Donald Trump will remain enamored, enthused and engaged. More specifically though, I am eager to see how tea party members will respond to our new President. As a movement that has for the most part been known for its allegiance to Principle and the Constitution, will its members continue to overlook Trump’s policies that might violate both? 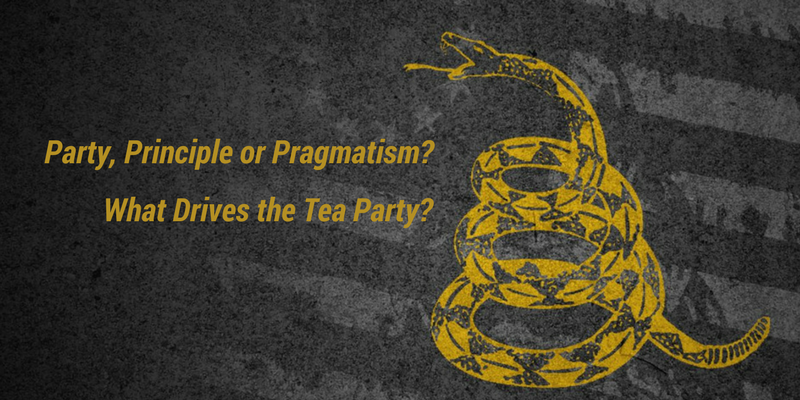 Will the tea party devolve into simply a pragmatic political force? Or will the movement that became the rallying cry and impetus for one of the greatest political victories in the modern era, embrace the spirit of the original Tea Party in 1773, standing on principle first and foremost? As Donald Trump readies to take the oath of office next week, he will not only assume charge of the most powerful nation in the world, but he will also oversee the world’s largest economy. And Trump will be aided in his oversight of our economy by a Congress controlled by a Republican Senate and Republican House. It’s been ten years since our nation was led by a Republican-controlled trifecta (Presidency, Senate & House). The last time this occurred George W. Bush was President. 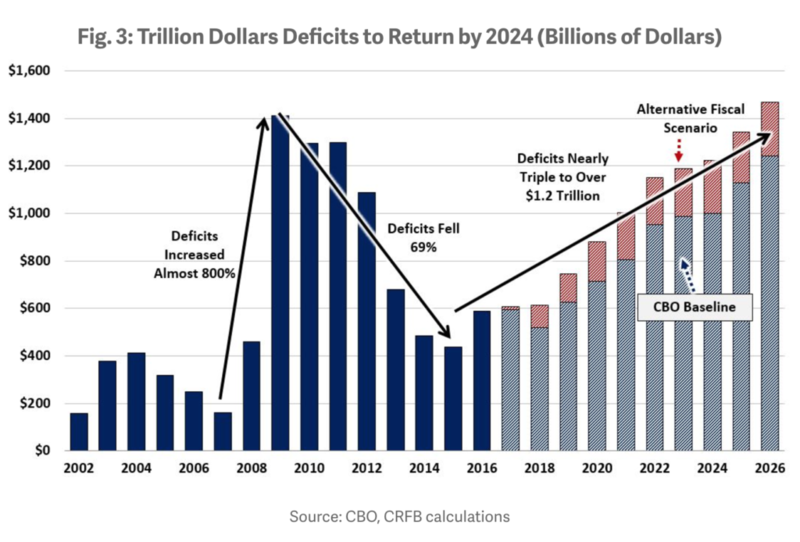 When the “conservative” Bush left office in 2009, with Republicans having controlled the Senate and House for half of Bush’s eight years in office, our 43rd President had doubled the national debt to just over $10 trillion with his deficit spending policies. Eight years later though, as Barack Obama is leaving office, our published national debt is on the verge of surpassing $20 trillion. 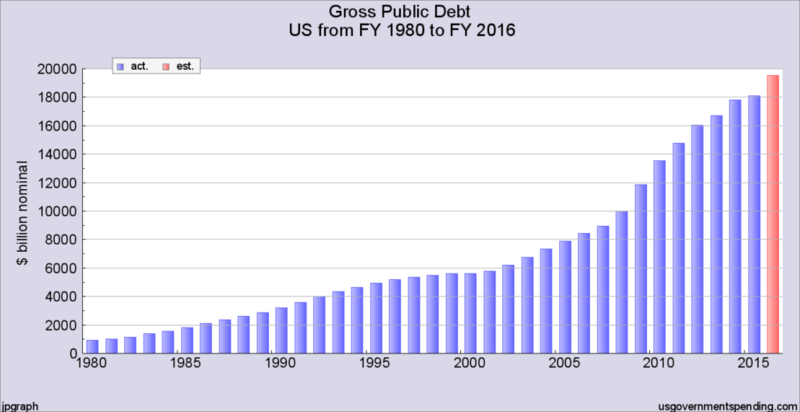 (I say “published” debt since our unfunded liabilities exceed $100 trillion, a topic that I discussed in my previous article, American: The Point of No Return?) If ever there was a financial house that is spinning out of control, it is ours. Many in America are hopeful with our new President about to take office. Trump’s no-nonsense, tell-it-like-it-is attitude attracted tens of millions of voters to support him. His willingness to say what many were thinking no doubt won him the election. Further, Trump’s 50 year track record in business convinced many voters that he was the man to turn around our economy and create a thriving, fiscally sound America. Donald Trump: The $10 Trillion Man? But this last week, Senator Rand Paul took to the Senate floor to rail against his own Republican colleagues as seen in this powerful video. 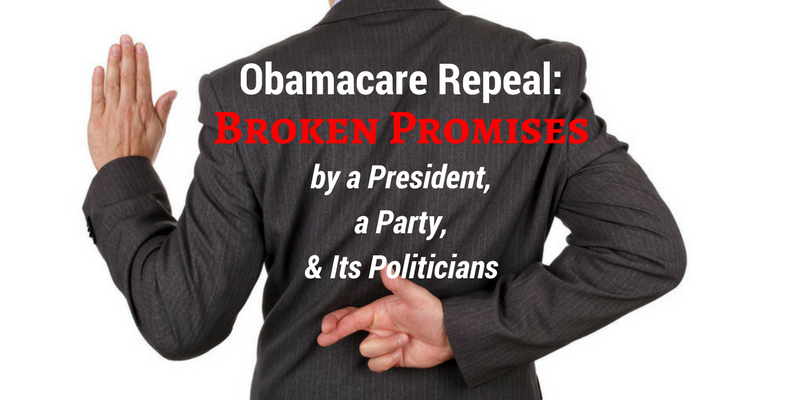 According to Paul, under the plan to repeal Obamacare, Republicans will likely be voting in favor of a budget that would increase the nation’s debt by another $10 trillion over the next ten years, matching Obama’s own dismal performance. This slide from Paul’s presentation illustrates the point the Senator was making. Republicans were fond of lobbing threats of government shutdowns, making incessant demands for balanced budgets and excoriating Obama and Democrats for their own deficit spending during the Obama era. And rightly so. But now that they are in the drivers seat, is it actually possible that Republicans will do no better? Will they maintain the fiscally ruinous course upon which our nation is set? Where are the Tea Party & Fiscal Conservatives? Eerily silent as the Republicans take control of Washington, are the groups that heretofore have been the voices of fiscal reason, and have historically led the way in demanding that our elected officials spend no more than they collect in revenues. And their silence is deafening. The tea party movement, of which I have been an active part since its founding in 2009, all but abandoned its defense of fiscal soundness, during the general campaign in 2016. Tea Party Patriots, the nation’s preeminent coalition of tea party members and groups, and many other conservative watchdogs, said nothing about Trump’s calamitous economic plan. 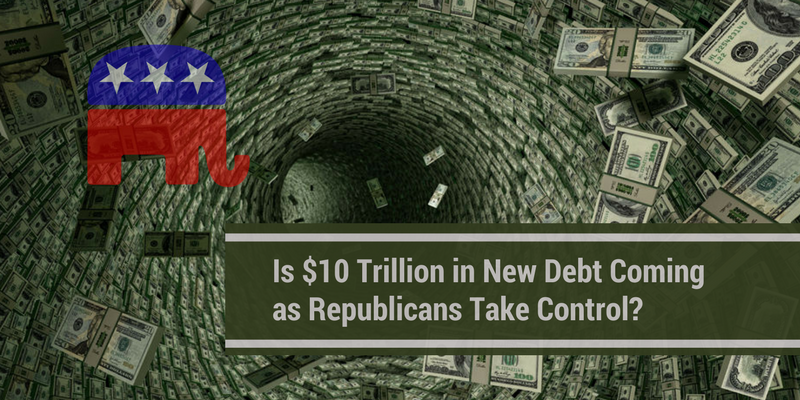 This despite the fact the new President’s plan could add up to $20 trillion to our nation’s debt, according to a recent study by Committee for a Responsible Federal Budget. 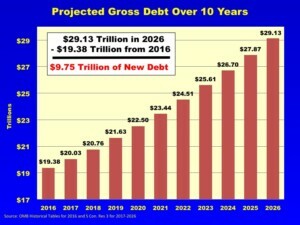 Their report revealed that our nation’s federal debt would soar to $39.5 Trillion by 2026, double the current debt. But now the day has arrived and Donald Trump and his Republican allies have been handed Washington to them on a silver plater by frustrated and angry voters. Those voters elected Trump because of their disdain for politicians who consistently promise one thing but deliver something altogether different. We’ve all been told, “it matters who governs.” But it will only be true if grassroots Americans do more than simply vote. They… or we must remain engaged. Our voices must be heard in an unprecedented, unmistakable, and unambiguous manner! Trump and our Senators and Representatives must know that they were not elected to maintain the fiscal status quo. The Tea Party, and all fiscally conservative Americans, must, like Rand Paul, call out Republicans and Donald Trump. We must warn them that they were not elected to put the final nail in our fiscal coffin. Trump cares not about the media, the social elite, the Hollywood snobs, or the connected wealthy, as he once again reaffirmed this week in his most recent press conference and barrage of tweets. But I do believe there is one demographic to whom Trump will listen: the grassroots, the blue collar workers, the forgotten middle class, and the traditional American, who still believe that if you work hard and play by the rules, you will be rewarded. So it is incumbent on you and me to reach out… once again, to an elite ruling class. It is necessary for us to remind them that we sent them to Washington to repudiate the status quo by restoring fiscal responsibility; honoring the Constitution; and empowering the free market. 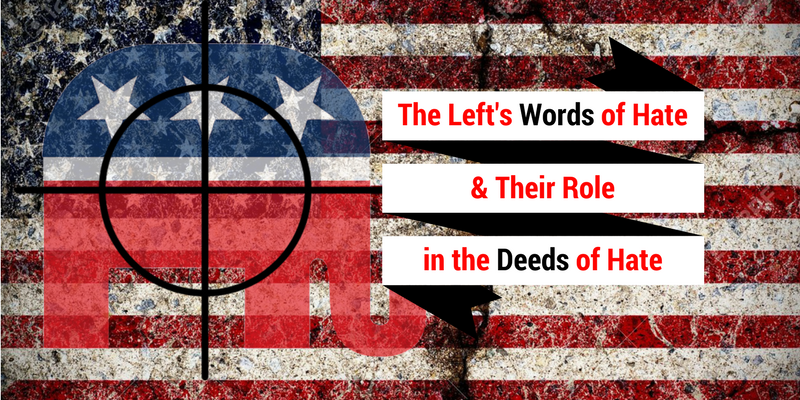 Reestablishing these three pillars, which are the core values of the tea party movement, will enable our great ship of state to slowly but surely reset its course in the direction of real prosperity, the kind that our Founding Fathers envisioned. But as we do the work to reshape our nation, let us never forget that fiscal prosperity will only flow from men and women of decent, moral character. And we will only “Make America Great Again” if we first Make America Good Again, as I discussed in my previous article of the same title. With the election of Donald Trump, roughly half of Americans are hopeful, while the other half are dejected, if not alarmed and angry. While that may be a slight overgeneralization, we can probably all agree that the campaign leading up to the Presidential election was one of the nastiest in recent history, characterized by intense personal attacks, with little attention given to the many challenges our nation is facing. One such challenge is our exploding national debt and its dire implications for you and me. As someone who has been a fiscal conservative all of my adult life, I was sorely disappointed to see such little attention given to the financial welfare of our nation. With our nation approaching $20 trillion in current debt, it should come as no surprise to anyone that a financial storm, like none we have seen, is likely in our future. Yet, neither Trump nor Clinton spoke much of our debt. When it was mentioned, it was simply noted in passing, with no plan by either candidate to halt, much less reverse, the current course we are on. While it’s understandable that neither candidate was interested in tackling America’s festering cancer, what is alarming is the fact that many of the organizations who have typically decry our national debit, remained silent during the campaign. As the founder of the Chattanooga Tea Party, our organization locally, along with the national tea party movement, has consistently focused on fiscal issues over the last seven years. Likewise, the Republican Party has historically been the party of fiscal responsibility, if not in action, at least in words. Yet nationally, both the Tea Party and the Republican Party said very little about the silence of both Hillary and Trump concerning our fiscal nightmare. With reference to our national debt though, the old adage, ignorance is bliss, does not apply. In fact, choosing to ignore what is certain to cause calamitous events in the not too distant future, is akin to knowing one has cancer, yet discussion of the illness is avoided, hoping it will somehow go away. 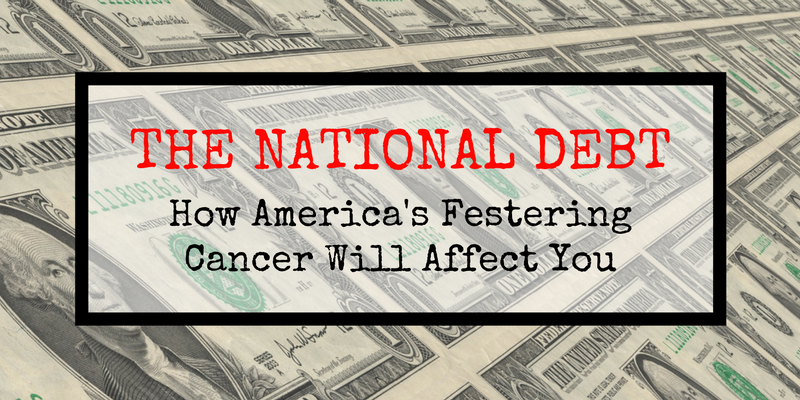 So just how bad is our fiscal cancer? Just as a picture is worth a thousand words, the following three charts illustrate the magnitude of our $19.5 trillion debt. 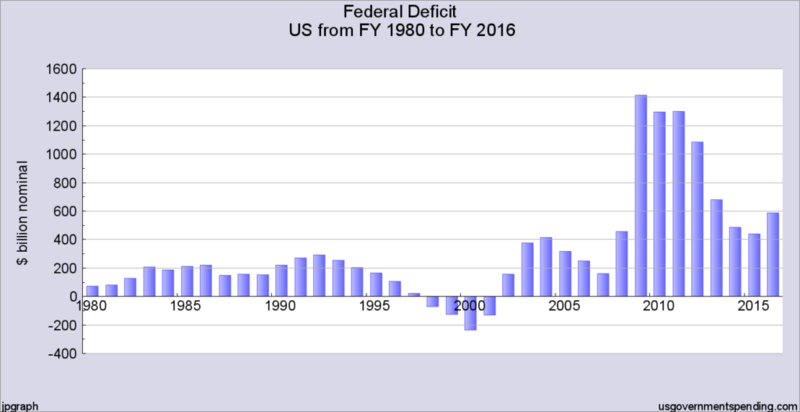 To be certain the terms are understood, deficits are the annual differences between what our government takes in versus what it pays out, or spends. The gross debt is the cumulative sum of those annual deficits. As the charts depict, for decades our nation has been spending well beyond its means. In fact, during the last two Presidential administrations, the US incurred an approximate $15 trillion of new debt, with nearly two-thirds of that amount being added during the Obama era. Larger than the 500 largest public companies in America. Larger than all the assets managed by the world’s top seven money managers. 25x larger that all the global oil exports in 2015. 155x larger than all the gold mined globally in a year. Larger than the sum of the world’s physical currency, gold, silver, and bitcoin combined. But as troubling as this should be to any American, the future looks even worse according to the Congressional Budget Office (CBO) projections, as presented by the Committee for a Responsible Federal Budget. CRFB is a nonpartisan, non-profit organization committed to educating the public on issues with significant fiscal policy impact. Despite the magnitude of our debt, there have been some who have suggested that our soaring debt is no big deal. Rather, they have asserted that debt is good, particularly when interest rates are at historical lows. Every budget is finite, even one as large as our federal government’s, which is now approaching $4 trillion per year. So as certain components of that budget increase, they either crowd out other line items or they demand greater borrowings to meet the shortfall caused by deficit spending. Our nation has enjoyed historically low interest rates for a number of years. But when those interest rates invariably rise, so will interest costs. 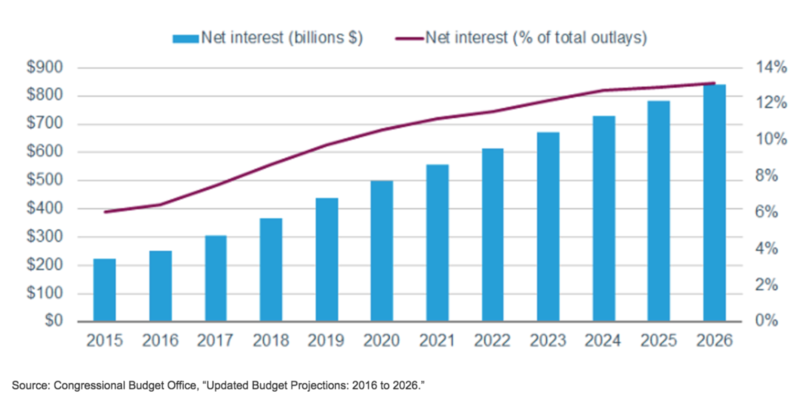 In fact, the CBO projects that those rising interest rates over the next ten years will increase the federal interest costs from $223 billion in 2015 to $839 billion in 2026. This will lead to fewer dollars available for other essential government programs, including the military, Medicare, Social Security, infrastructure and more. Economic growth is threatened as national debt increases. Wages are depressed and the availability of jobs is minimized. The stability of Medicare, Social Security and Medicaid is jeopardized. Personal costs of living increase as interest rates on individual credit ratchet up. Burden for repayment of nation’s overspending today will be heaped on our children and grandchildren tomorrow. As debt increases and spending accelerates, likelihood of another financial crisis increases, endangering personal wages, jobs, and investments. As I mentioned at the outset, half of Americans are hopeful and even optimistic about what a Trump Presidency portends for the days ahead. But with great opportunity comes great responsibility. So as Republicans maintain control of both houses and gain the White House in January, how will they behave? Will they move the country forward in a manner that acknowledges the threat of our growing debt? Will Republicans guide our government and nation back in the direction of fiscal solvency? Or will their new found status in Washington reveal what they have done for too long now, campaign on grandiose promises that fall short on delivery? Time will tell. But one thing is for certain, the longer our fiscal cancer is ignored, the more likely the ultimate diagnosis will be one from which we may never recover. If you care to weigh-in on this matter, be sure to let your Congressman and Senator know that you expect them to support plans that will move away from deficit spending and toward a balance budget. While it cannot be done overnight, the road back to fiscal responsibility must begin in 2017 under a Trump administration.